Your registration includes a day of fun and fitness plus activities and support from the day you register until the Bloomin' Metric®. From the time you arrive and throughout your ride and on your return, we make certain that you don't go hungry. Breakfast will be available on your early arrival. 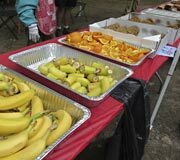 During your ride there will be numerous food stops along the way. Three stops are available on the 75- and 100-kilometer routes and one stop is available on the 40 kilometer route. There are no food stops on the 25-kilometer route and this special ride will be led by experienced ride leaders. Once you return to Sherwood Island State Park you will see that the event area has been transformed into a food truck extravaganza. Then stay for the afternoon for music and the big raffel, along with massages for those who would really like to relax. Before your ride, start off with breakfast. We serve coffee, bagels, oranges and bananas. Munchkins, too! The Bloomin' Metric® has 3 fully serviced food stops, serving the 40K, 75K and 100K routes. The food trucks will be back. 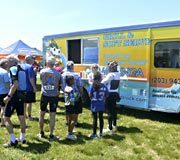 For your after-ride meal, choose from one of many food trucks, and there is ice cream. Stay all afternoon and enjoy live music, raffles, and after-ride massages by the beach. Parking opens at Sherwood Island and breakfast becomes available. Check-in/Registration opens. You must bring your helmet. This ride is self-paced for the 100-, 75- and 40-km rides. It is NOT a race. 25 km (15 mi): Will meet at 9:00 am and be led by experienced ride leaders leaving at approximately 9:30 am at an average speed 10mph. Rest stops on ride routes close. The 40 km has 1 food stop, the 75 km and 100 km routes have 3 food stops. After your ride, participants enjoy free: Lunch from local food trucks. Use the stub on your bib for your lunch. (Additional tickets available for purchase.) After-Ride Massage, Live Music, Raffles, and more! Stay and enjoy the day at Sherwood Island! 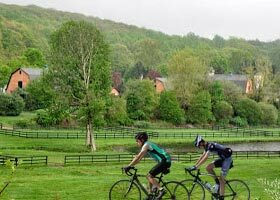 Four incredible, well-marked routes, along a beautiful Connecticut shoreline and through a classic New England countryside are featured in this popular bike tour. Choose your route on the day of the Bloomin' Metric®. You can switch routes during the early portions of your ride as the routes overlap for a few miles. Our routes have extensive ride marshal and police support to keep everything running smoothly and safely. This route was designed specifically with the new or novice cyclist in mind. You will be joining a planned group lead by experienced ride leaders who hold the groups together in a tour-like fashion, guiding the riders along the course. This may be a perfect opportunity to get comfortable with group riding and learn more about the sport of cycling. This course offers fairly easy terrain. 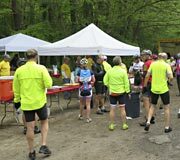 We plan on starting the ride at approximately 9:30 am along a shared route with all the other riders as it travels from the shoreline of Westport, with beautiful views of Long Island Sound, into Southport Harbor and turning slightly north of Route 1 in Fairfield. As you head back west into Westport you'll pass by old farmlands and a hunt club. Plan on arriving at the park early to allow yourself time to park, gather your bike, helmet, water bottle, etc. and going through the registration process. Listen for announcements around 9:00 am when we start gathering up the groups. For details, click here. A cue sheet and map for this route will be handed out by your ride leader. This route travels slightly more inland than the shortest route but still shares views of Long Island Sound in Westport. 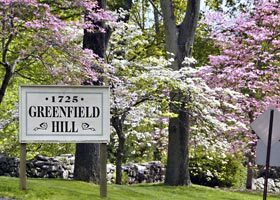 As you continue north into Fairfield, you begin to ascend Greenfield Hill, known for it blooming dogwood trees, for which the Bloomin' Metric® was named. Remember, this is not a race. It's a bike tour with plenty to see, so take your time and enjoy the scenery. 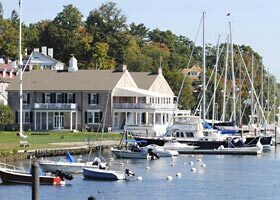 This route only passes through two towns – Westport and Fairfield but both offer beautiful shoreline and inland views. The terrain is a combination of rolling with some hills and plenty of flat sections. 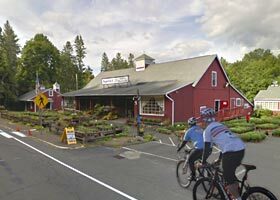 The course will travel just north of the Merritt Parkway passing through some horse farm country before you make your way back into Westport and to the one food stop on this route. From there, there will be a series of nice long downhills and gentle undulations before you start heading back to Sherwood Island State Park. Access to cues & map and GPX file for the 40 km route for download will be available a few weeks prior to the event. For the more ambitious rider or those who want more of a challenge, this route offers all kinds of terrain from flat to rolling hills to challenging climbs. The course travels through five towns passing along the shore in Westport, heading up to the rolling hills of Fairfield and around the reservoirs in Easton, Redding and Weston. From a scenic point of view, the course features crashing waterfalls and classically quiet, narrow, totally tree-covered country roads. The route profile slowly builds to a crescendo with a climb to the top of the reservoir in Redding before descending down to Weston. There are three food stops along the route with two specifically placed for the 75-kilometer riders. The extra stop is placed to service the 100-kilometer riders who share their return route with you. Once reentering Westport there will be some fast downhills and a few rolling hills before flattening out on the return to the park. Access to cues & map and GPX file for the 75 km route for download will be available a few weeks prior to the event. For seasoned cyclists or those who want more to stay on the bike for a longer ride, this course features flat to hilly terrain and everything in between. This route travels through seven towns and follows all of the 75-kilometer route with an added 25-kilometer loop that truly defines the word bucolic. The upper loop enters Newtown and finds its way through narrow, winding roads, past lily ponds and crashing waterfalls within the Poverty Hollow section of the course. As the route circles around you will find yourself in farm country with plenty of horses, cows, sheep and goats watching you pass by. There are three food stops along this route to make sure you are completely refueled for the remainder of the ride. After the rollercoaster ride around the Saugatuck Reservoir, you'll flatten out somewhat as you head down toward the shore and into the park at Sherwood Island. Access to cues & map and GPX file for the 100 km route for download will be available a few weeks prior to the event.